In the West we call the laws of nature “physics” yet this word is an abstract mental construction. What is the human scale everyday process of FEELING these laws, not just the mental architecture DESCRIBING these laws, as is done in mathematics and Western science? How can we feel these “laws” deep inside our bodies, separate them, and then recombine them as new and more well defined feelings every day and every practice session? The 16 Nei kung is the ancient Chinese method taught for millennia inside Daoist monasteries and communities for methodically learning how to feel reality, not just visualise or “think” about reality. The truly remarkable payoff of learning this material is that one can learn to interact skilfully, spontaneously, and profoundly with anything, anytime, anywhere. In society, people with good postural alignments/abundant energy/smooth nerve flow etc. CAN interact with their environments more effectively and have more fulfilling professional, emotional and social lives. Wether they choose to is another matter. Being able to act spontaneously without creating mental scenarios; learning to become completely still through release not contraction is a primary goal of Daoist practice. With this ability to have a relaxed unbroken focus and later, diffused encompassing concentration for continuos and ever longer periods of time, positive change deep within the structures of our being is inevitable. Having personally grown up surrounded by the language of physics and having studied psychology I often use their terminology to try and explain the Nei kung; nevertheless, only actual feelings will do. A standing wave is created by balanced opposing energies. 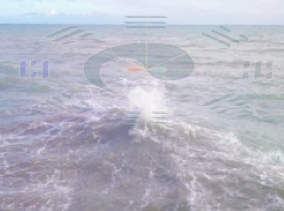 When a yin yang taiji interaction becomes stable, a resonance AND entropic state emerges (wuji). Inside the body this balanced resonance allows the body to let go of trapped behavioural triggers/patterns/expectations with astonishing speed and benefits. I found this out for myself whilst recovering from a chronic debilitating illness that 3 consultant medical doctors told me I could “never” recover from. 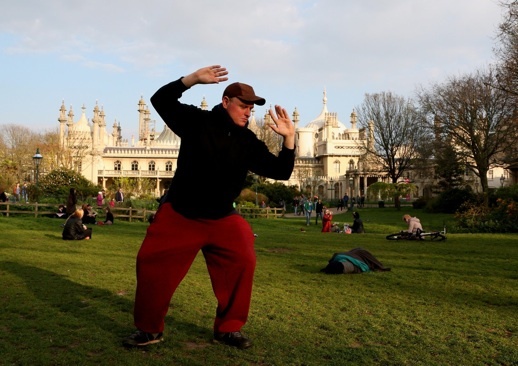 The first chi kung set taught within this tradition, is called Dragon Tiger medical chi kung, and originates from the innermost sanctum of the Shaolin temple in China. It is relatively simple to learn consisting of 7 repeated movements designed to radically enhance overall vitality/ calm the mind. Chi kung creates a foundation for, and opens a series of “safety valves” vital for the more involved Nei kung (simultaneous stacking of the Chi kung flows). The foremost practitioner of these arts I have ever met is called Bruce Frantzis and remarkably, to any one with cultural stereotypes floating through their perceptions, is American. He is the only person ever to have been given permission (by Daoist spiritual immortal and head of the northern Daoist schools of all China, Liu Hueng Chieh) to open the previously hidden water AND monastic fire traditions up to the general public. visit http://www.taichimaster.com/ for Bruce’s personal blog and http://www.energyarts.com/ to access his business website. As a metaphor for a balanced Nei kung movement, this animation is great. In a Nei kung cloud hands movement you shift the pressure (energy) from your left leg (blue/grey line), to your right leg (yellow line), and for a moment the pressure waves (the pink line) are momentarily completely balanced (flatline). In that split second if you can feel both waves of energy clearly, you can actually begin to move left AND right at the same time. This activates both central nervous commands simultaneously, and begins the squid like, hydraulic internal control Taoism is famous for developing. This non intuitive principle also works for the diaphragm going up and down with each breath. Breathing methods, from the simple to the complex. Moving chi along the general direction of the various ascending, descending and lateral connecting channels within the body. Moving chi in specific ways throughout the body. Dissolving, releasing and resolving all blockages in the eight energy bodies. Bending and stretching the body's soft tissues. Opening and closing methods (pulsing). Working with the energies of the external aura. Amplifying the circles and spirals of energy inside the body. Learning to move chi to any part of the body at will. Awakening and controlling all the energies of the spine. Awakening and using the body's left and right energy channels. Awakening and using the body's central energy channel. Developing the capacities and all the uses of the body's lower tantien. Developing the capacities and all the uses of the middle and upper tantiens. Integrating and connecting each of the previous 15 components into one, unified energy. Nei kung differs from Chi kung in many aspects. Chi kung was developed from Nei kung and is a relatively modern education system for maintaing and boosting health. Nei kung is an education road map for developing strength and power whilst maintaining sensitivity and can be thought of as a “weaving of chi kungs” so they can become one. Here are the 16 “chi kungs” that form the 16 part Neikung.